How to Use Geppetto: Walkthrough Guide for Embedded Board Design | Gumstix, Inc. Welcome to Geppetto's How-To Guide. 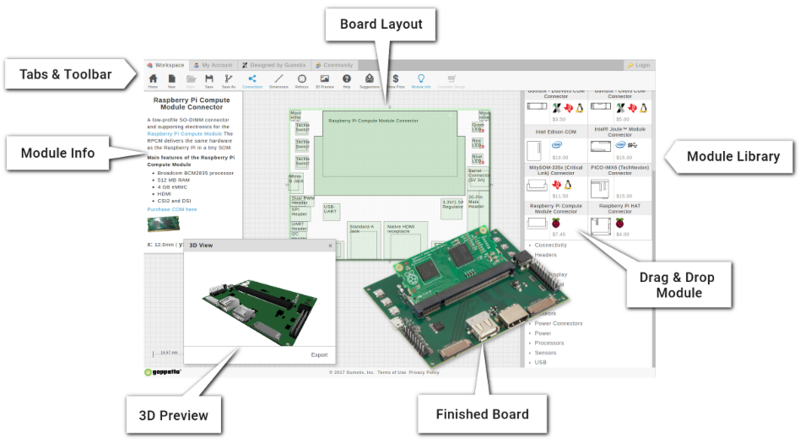 Geppetto is Gumstix' design-to-order tool for creating custom expansion boards quickly and easily. A design can be completed in hours minutes, and ready to ship in 15 business days. New to Geppetto? Get started below! It is one of the easiest ways to start a design in Geppetto. You just choose and select from a list of functionalities, click a button and the modules will be on your board. The Geppetto Board Builder is one of the ways to start a Geppetto design. How to use the Board Builder? Select the group you want on the board (e.g. COM or Processor). Board Builder will suggest a list of COM or Processor you can choose from on the left box. If you don't find what you need, use the Search functionality. 2. Click the [Start Build] button. Board Builder will add and position your modules on the board. Board Builder also includes a power suggestion phase. You will enable this feature by following the on-screen prompt after the modules has been added. Once you're finished with steps 1-3, you will have a board that's ready for your review and finalization. Find modules from the righthand library. Modules are functional blocks that offer a specific feature, such as power, sensors, connectors, and more. To add a module, simply drag and drop its graphic onto your board. Drag modules with your mouse to position as desired. For more precise placement, you can nudge the module with your keyboard's arrow keys. You should keep modules within the board boundary, and in their own space (ie. not overlapping with another module). To connect a module, hover over it and and click the requirement flags that appear. Flags allow you to establish dependencies, including power requirements, between specific modules. Color-coded requirement flags will display when you hover over a module. The flag color will indicate what needs to be done. A red flag means that its dependency needs to be fulfilled by a new module from the library. Clicking this flag will make the module library automatically display matching options. Any of these options will fulfill the requirement. When you add a valid module to your board, the red flag should detect it and turn yellow. You can now connect those two modules via their flags. A yellow flag means that another module on your board can fulfill its requirement. 1. Clicking the yellow (5.0V) flag causes a new flag to appear by the valid module. 2. Now, clicking that new flag establishes the 5.0V connection. A connection is complete when the flag turns green. 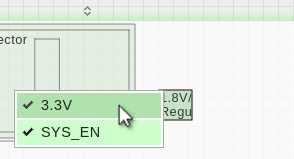 You can check where the module is connected by clicking this flag. 1. Click the requirement flag that you want to disconnect. 2. Another green flag will appear on the provider. Click it to finish disconnecting. The requirement flag should now become yellow, meaning it has disconnected. Or click on the module and press R on your keyboard. The module will then rotate 90 degrees counter clockwise. Repeat until you achieve the desired rotation. Or click on the module and press Delete on your keyboard. Colors indicate the status of your board and modules. Find explanations of each status below. A dependency or requirement is missing from the board. Some connections have not been met, but can be satisfied by an existing module on the board. All dependencies have been met. The module cannot be placed here. Placement can be invalid if it is off the board, or overlapping with another module. The module can be physically placed here. The board is incomplete. Either the module is not properly placed within the board, a dependency is missing from the board, or both. There are unresolved connections between the modules on the board. All connections and dependencies have been met. The board is ready to be submitted for verification. Home: Return to the Gumstix homepage. New: Start a new design. Open: Browse and open your saved designs. Save / Save As: Save your design into the My Account tab (requires an account). Share: Share your design to colleagues to give them view access to your open design. Connect: A mode allowing you to view and create connections between modules. Dimensions: A mode allowing you to take measurements. *For more information about Connections and Dimensions, see Modes. Refocus: If you lose sight of your board, re-center it here. 3D View: View your board as a to-scale 3D model. Help: View a quick tip slideshow. Price: Get a cost estimate for your working design. Validate: Create a product page for your design (requires a store account). You can choose to submit your design for manufacturing from here. Autodoc: Generate a document about the open design. AutoBSP: Generate a board support package (BSP) specific to the open design. 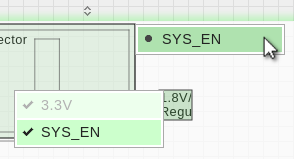 Allows the requirement flags to appear, which represent the connections that are necessary for a module on the board. You can only connect modules while this mode is toggled on. Please note that Connections mode disables Dimensions mode, and vice versa. Allows you to control your board size, set the distance between the edge of the board and a module, or the distance between two modules. First ensure that Dimensions mode is on. Then, hover over the edge of the area to be measured until you see a dashed line. 1. Click the edge to start a dimension. 2. Click the opposing edge of the area to complete it. Your dimension should now appear. Geppetto recognizes measurements in increments of 0.5mm. You can input a value to adjust the distance, and right-click to lock the dimension. Lastly, you can also use this mode to view the static size of any module. Allows you to see module information and access the data sheets for components associated with the module. To view the information, click a module while this mode is toggled on. You can sign in via your Google or Yahoo account, or use your e-mail address to create a Geppetto account. Once logged in, your saved designs will display here. Also find toggles to change your theme colour to blue or black. The Designed by Gumstix tab shows various boards sold by Gumstix and other boards designed by Gumstix Engineers. You can clone these boards and modify them to your design specifications. In the community tab, you can see designs shared by others in the Geppetto community. You can clone a board from here, or make a design based on another. Sharing designs is optional as part of the save process. In the shared with me tab, you can see designs shared by colleagues and friends only available to you. You can clone a board from here, or make a design based on it. Sharing designs is optional. You can rename a module on your board when you do a right-click. You can view, download, and upload connections of any given module with Connections when you right-click a module on the board. Please check Geppetto Orders for more information.